The Motion Effects Editor in Avid. In my video editing wish list, I briefly touched on the Motion Effects Editor in the Avid Media Composer editing system. 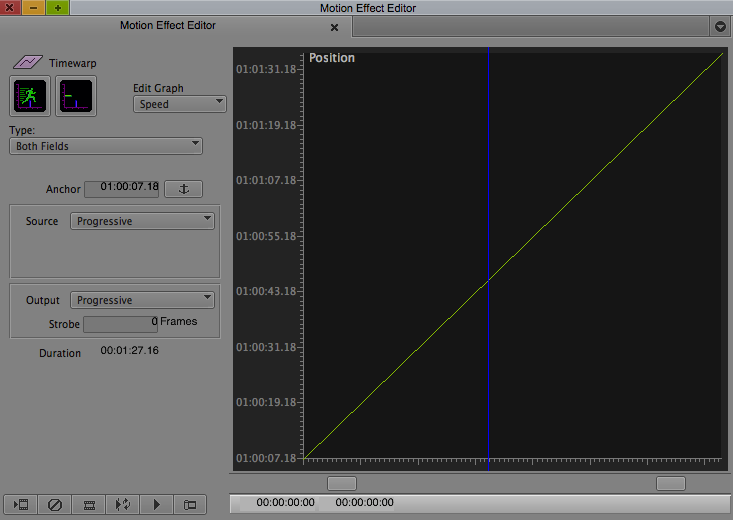 There are are a lot of things I like about motion effects in the Avid system, but it has a long way to go. I love the standard Motion Effect dialog, the Fit to Fill Edit and some of the Time Warp effects including Trim to Fill. Beyond that, things get a little grayer. 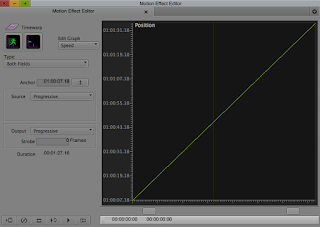 I have been using the Avid system since before the inception of the Motion Effect Editor and I still don't get the usability of the Speed and Position graphs. Am I alone in this? Is it because I am used to the easy and elegant way that Adobe After Effects does its Time Remapping? Time Remapping in After Effects. In After Effects Time Remapping is simple. After you enable Time Remapping, you get 2 keyframes in your timeline - one at the head and one at the tail. You can add any keyframes wherever you like depending on how you want to adjust the speed. If you drag two keyframes closer together, you decrease the time it takes to play, thus speeding up the playback. All keyframe dragging is done in the active timeline, not in a graph. The Avid Motion Effects Editor would be much more useful if I could see what effect my adjustments are having in relation to the sequence timeline. As is, the Avid Motion Effects Editor is hit or miss, with no real-time feedback as to what is going on. I'd like to hear from other Avid editors to find out if you believe the Motion Effects Editor in the Avid Editing systems is a useful tool. I've explored the Motion Effects Editor in Avid on numerous occasions and always revert to using After Effects for fluid motion effect changes or the classic motion effect otherwise. I consider the Avid editing system to be the most versatile and intuitive system out there - the Motion Effect Editor is very un-Avid.